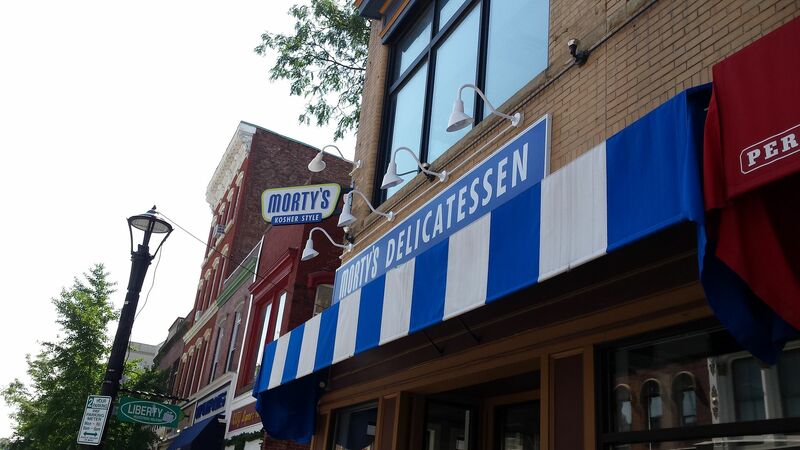 My wife and I went to Albany this weekend and while most of what we ate in Albany isn't worth mentioning, we stopped for lunch today in Poughkeepsie at a Jewish-style deli called Morty's. I found it by just searching online for places to eat along our route heading home. This place was plan C for us. We were initially going to go to Pepe's Danbury location for pizza and possibly the Red Rooster Drive-In for ice cream for dessert. But I had been to Pepe's and had white clam pizza a few times before and it was a bit more of a detour than we felt like taking. I then came up with White Rose System for sliders, as it's right along our route. But we had a long wait until we would get to Linden and we were getting hungry, so I checked my list and spotted Morty's. It was one of the best food-related decisions I've ever made. Morty's is right downtown on Main Street. I then had a good piece of luck in that they were out of what I ordered; kippered salmon, which I wanted on a bagel with all the fixings. 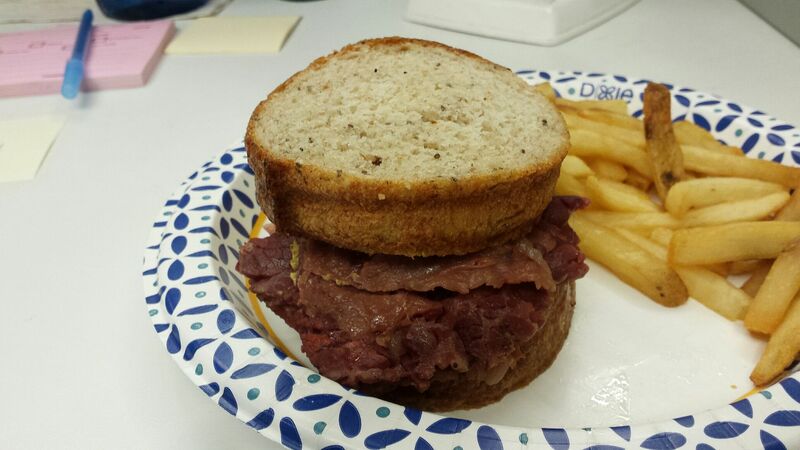 So I went with corned beef on rye with mustard instead. My first pleasant surprise was that the corned beef was hand carved. You don't see that at many places, but I have developed a definite preference for it over machine-sliced corned beef or pastrami. I initially tried hand carved corned beef at Katz's and now have it fairly regularly at Hershel's in the Reading Terminal in Philly. But this particular corned beef had something different about its flavor. It tasted like corned beef with a little something extra in there. I assume this was a result of what went into the brine. I've been eating corned beef sandwiches for about 50 years and would unquestionably say it is my single favorite type of sandwich (corned beef on rye with mustard). So I don't say this lightly, but I'm not sure I've ever enjoyed a corned beef sandwich more than this. 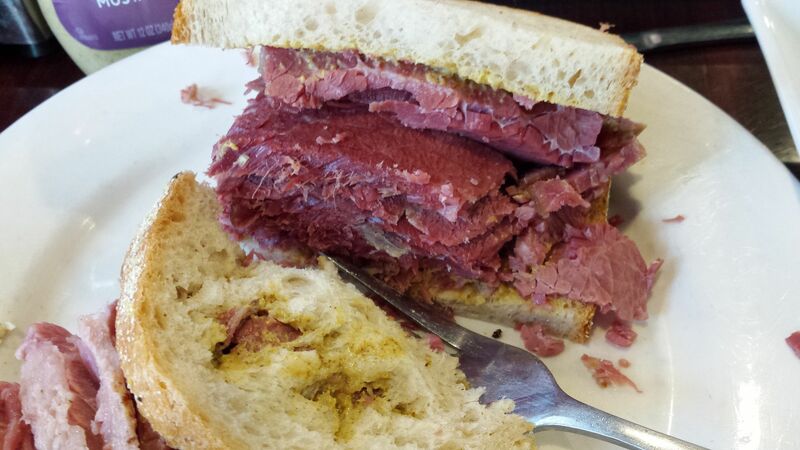 I've had other corned beef sandwiches that were bigger and as moist or moister (although this one was moist enough when it arrived, before the air started to dry out some of the exposed pieces) and also hand carved. But the flavor set this one apart. We're talking about going back to that area at some point to check out the FDR stuff at Hyde Park. 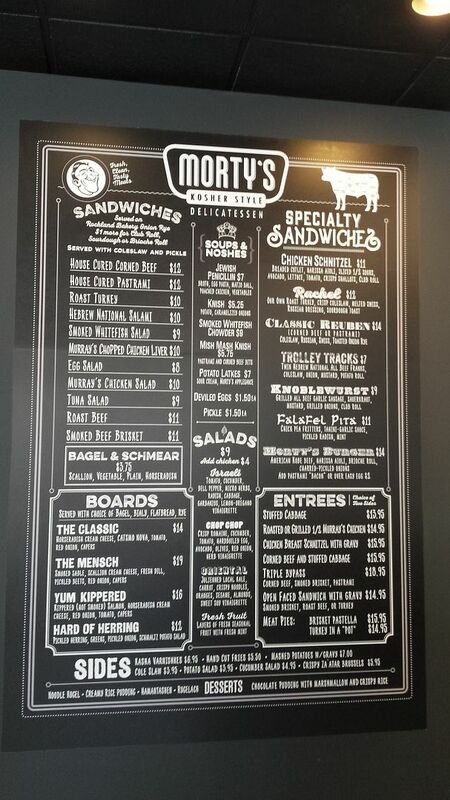 If we do, I intend to try Morty's pastrami. 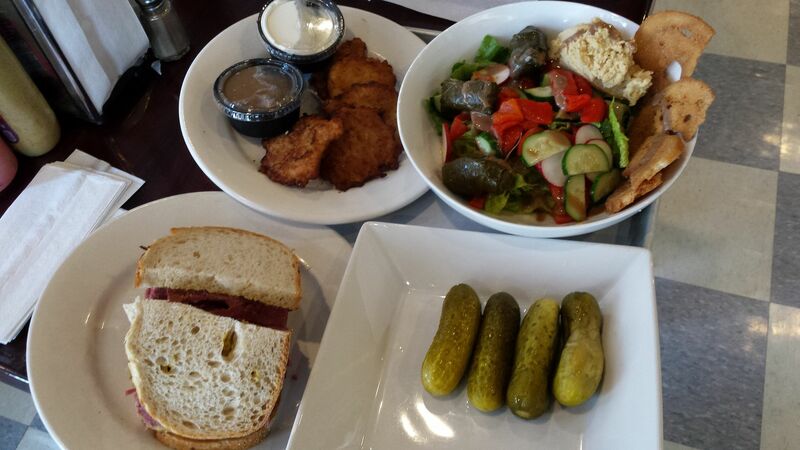 You should've gotten a pastrami-on-rye to go in case you got hungry on the drive home. How was the ratio? I love corned beef but sometimes it can be too lean, and if there's some fat it really goes well with the mustard (which is why I much prefer brisket point over flat and round). I was happy with the fat ratio. I don't recall having to decide whether to eat or pick out any big pieces of fat, but I wouldn't call it lean either. While it wasn't the biggest corned beef sandwich I've ever had, because of how hungry I was, I started eating it very fast and got fully pretty quickly. I did manage to finish it though. phlmaestro, great write-up! I was just in Highland, NY for an overnight with friends and we had lunch at a really good Greek spot in New Paltz. I may be heading back soon so I'll have to put Morty's on the list. Thanks. Will they let you in if you pick your feet? Excellent write up and fantastic pictures!!! I'm sorry to report I just read on a Facebook deli group I follow that Morty's has closed. Just saw this for the 1st time. I am going to be working in that area, so I immediately went to put Morty's on my Google Map......Permanently Closed. It only took a year for me to top the corned beef that I had at the now defunct Morty's, and the most incredible corned beef I've ever eaten is a lot closer to home than Poughkeepsie. It's right in the heart of Center City (downtown) Philadelphia. Michael Solomonov is one of the top chefs and restaurateurs in this region and arguably the country. 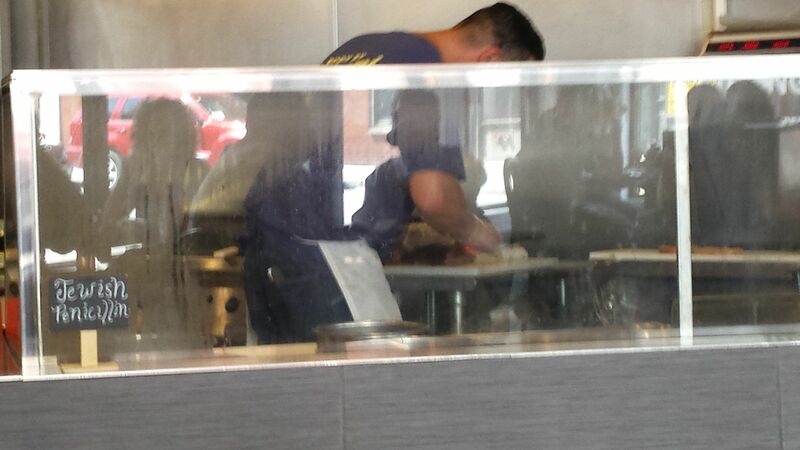 He recently took one of his low-scale restaurants that is actually a charity venture (the profits go to feed the hungry) and switched it from a general menu to a Jewish deli. It's a tiny menu. 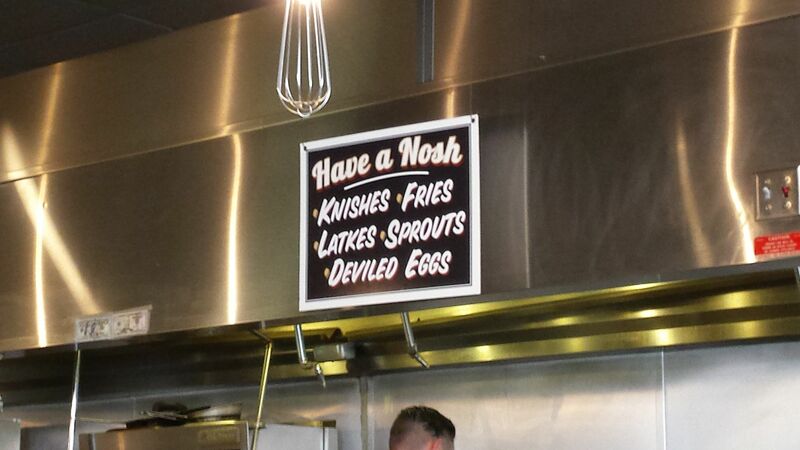 You won't find much of what is normally found at a Jewish deli. 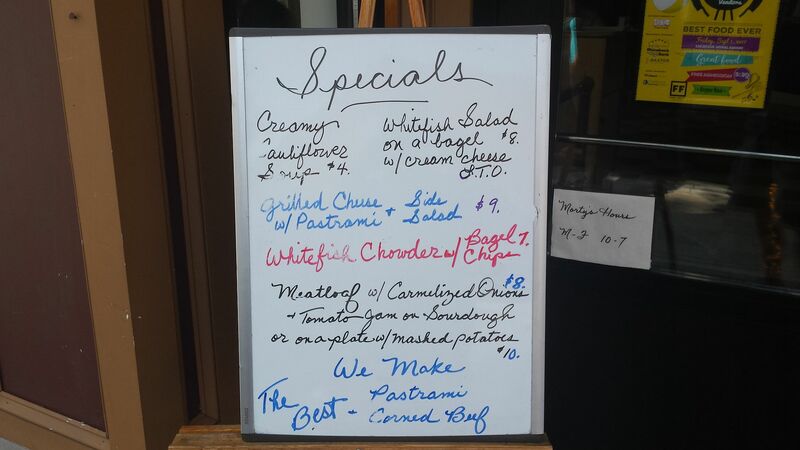 One of the items on there is Montreal smoked meat, not on rye, but on a potato roll, topped with onions and horse radish sauce. I'm really not sure how I'd like that. 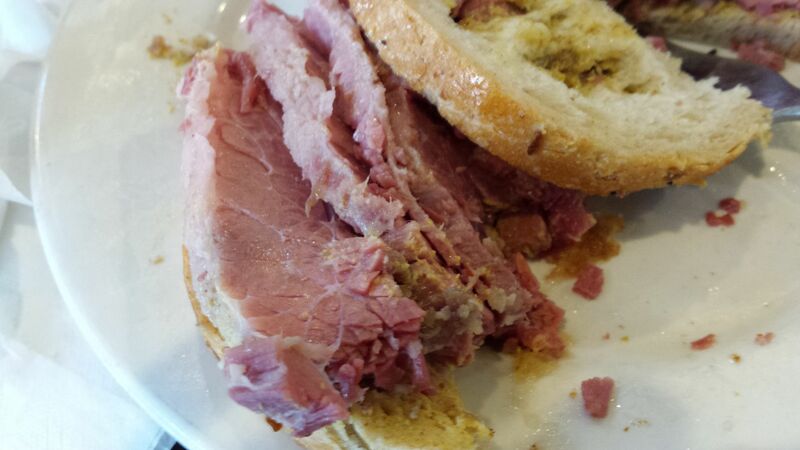 I have little doubt that the smoked meat itself is outstanding, but I'd want it on rye with mustard. 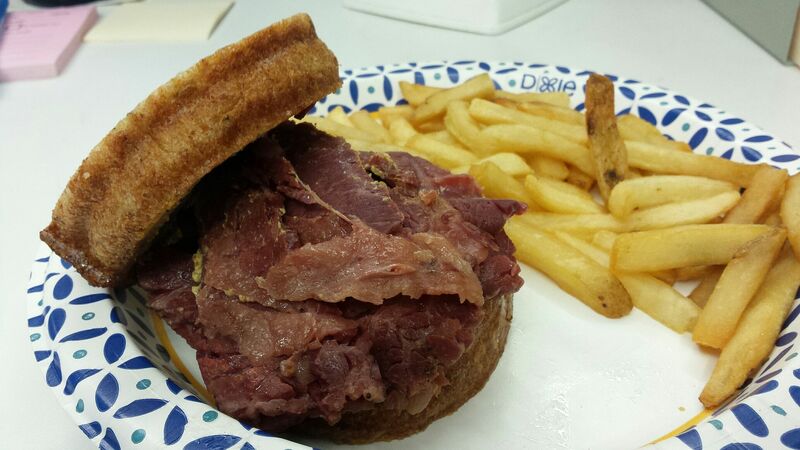 Thankfully, that's how the corned beef is served. 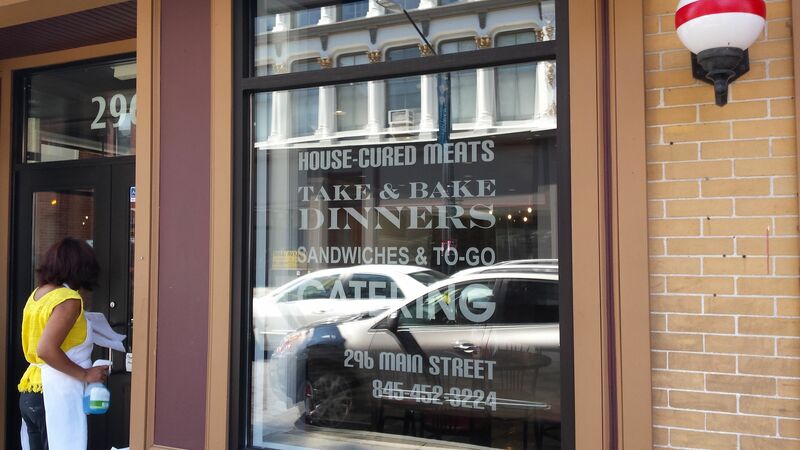 Both the meat and bread are made either there or at one of Solomonov's other local eateries. The bread is smaller in circumference, but thicker than most rye bread. There is no need to cut the sandwich to pick it up, but it's got plenty of meat in it. It's so flavorful and moist that I'm still on a food high and having difficulty containing my excitement an hour after eating it. It's possible I started eating corned beef before I began walking. It was always around when I visited my grandparents. 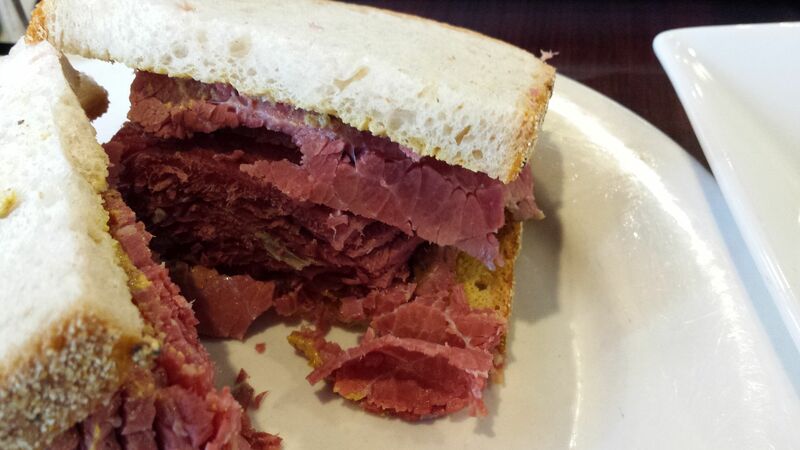 To have a corned beef sandwich that is this good is a really special experience for me.